Mary Pedersen | TV, eh? Murdoch Mysteries showrunner Peter Mitchell promised several Season 12 episodes would focus on other members of the series. He wasn’t kidding. Monday’s latest, “Operation: Murder,” saw Julia step into the spotlight as she investigated a series of deaths at the University of Toronto’s School of Medicine. Meanwhile, George was smitten by a young Florence Nightingale Graham (Kathryn Alexandre) before she left town in favour of a career in New York City. As for William? Well, his latest creation seemed intent on gobbling him up. We spoke to the writer of “Operation: Murder,” Mary Pedersen, all about what went on inside and outside Station No. 4. I had no idea Florence Nightingale Graham was Canadian. How did she come up in the Murdoch Mysteries research? Mary Pedersen: Every season we like to feature real historical figures, so we’re always keeping an eye on what important Canadians were doing around our time, and what famous international people might have been in Toronto then. Elizabeth Arden was on that list, and since she had actually attended nursing school in Toronto, it happened to dovetail nicely with the idea of a mystery set at the hospital where Ogden is completing her training to be a surgeon. Were there other facts about Florence/Elizabeth that didn’t make it into the episode? MP: What I find really fascinating about her is that she was the daughter of immigrants in small-town Ontario, her mother died when she was in her teens, and she went to nursing school to help support her family. So for her to go to New York City and go on to build her own cosmetics empire—really one of the first such businesses, with her name on the products—strikes me as a story of such bravery and determination. I would love to have been able to get into more of that, but of course we’re dealing with just a small moment in her life, really before she knew what she would become. I hope we were able to depict a little bit of what was to come through George’s enthusiasm for her dreams. He has a special skill for giving talented women a nudge in the right direction and I love that about him. Peter told me that other characters would get more screen time this season. That started tonight with Julia doing the investigating. How refreshing was it for you to write a mystery where William took more of a back seat? MP: I’ll tell you, I loved it. I got a little cocky writing the first draft; I was telling everyone I could totally write a medical drama if I had to! That’s from years of being a devoted fan of ER and Grey’s Anatomy. Of course, you wouldn’t actually want me doing a tracheotomy! Luckily, I have friends and family in health care who coached me through the medical stuff, and we have a terrific consultant to make the medical stuff look and sound good. So that was fun, to bring us into a different world, get to know Julia’s new workplace and the people there, and make her the primary detective on the case. I’ve always appreciated that Murdoch Mysteries has that latitude to make room for the actors to do what they do best, to explore different worlds and tones, and we hope that quality will help keep things fresh in Season 12 and beyond! Yet another woman enters George’s life ever so briefly. Will he ever find love? MP: He really comes up against his essential problem in this episode, doesn’t he? He loves ambitious, complicated women. He’s such a special character and I think he deserves someone who’s one in a million like him. But if he finds his true match, will she accept that he’s ‘just’ a constable, and will she want the same life that he does? I was so glad to see the incredible set for William and Julia’s house has stuck around for another episode. Is it as impressive in person as it is on-screen? MP: It is. Bob Sher and the art department did such an amazing job on it, really making it feel like a home that expresses who Murdoch and Ogden are. It’s become my favourite set to visit, and it’s much cozier than the morgue, so there have been a few times this season when I’ve snuck down and put my feet up on one of those built-in sofas to read a script. And there have been a few more great scenes shot in the house already this year. Next week Higgins and Ruth are scheduled to marry. [Preview picture above.] What can fans expect from the episode? 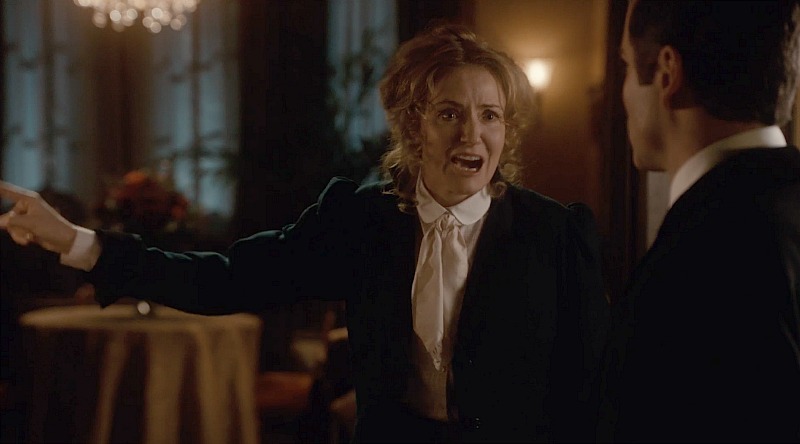 MP: The Newsome family episode has become really one of the highlights of every season for the writers, and you can imagine that with a wedding, the extended Newsome family coming to stay, Ruth determined to find George a girlfriend, and of course a murderer on the loose, that Murdoch, Brackenreid, Crabtree and Higgins will really have their hands full next week. Well Murdoch Mysteries fans, are you feeling a little better? After last week’s episode, “Shadows are Falling,” viewers were left reeling. Not only did Julia lose her baby to a miscarriage, but she and William had a major falling out. Julia had instructed Rebecca on how to perform an abortion, which led to a dramatic conclusion: William left the hotel and was last seen walking down the street. Thankfully, cooler heads prevailed. William, working the case of a missing woman alongside her supposedly distraught husband meant he could reflect on the things he’d said to Julia. And she spent several moments, with help from Inspector Brackenreid, recalling her own remarks. By episode end the pair had tearfully reunited. But not all is well. Nina and Crabtree broke up and—as many of you suspected—Violet is up to no good. I spoke to showrunner Peter Mitchell, writer-producer Mary Pedersen (who co-wrote the finale with Simon McNabb and Dan Trotta) and actress Hélène Joy about “Free Falling,” and a peek at what’s to come in Season 12. Peter, was the episode title, “Free Falling,” a reference to the Tom Petty song as well as what our characters were going through? Peter Mitchell: I think so. The Tom Petty song is a little bit about breaking up with the girl who is perfect for you and feeling kinda good about it. And also about all of the characters because they don’t know what’s going to happen next. Why was it important to keep Julia and William apart for the entire episode? Peter Mitchell: To establish some tension in the story. We’re often more willing and more able to talk to strangers about things that we’re thinking about than those who are closest to us. Of course, it was wonderful to have William and Julia reunite. But, you tore another couple apart: Crabtree and Nina. Why, Mary? Mary Pedersen: I think that was really natural. We love Erin Agostino. She has been wonderful and has really won over the fans which is really something because the character, on paper, doesn’t look like someone Crabtree should end up with. That’s really a credit to Erin’s work. That was the truth of their situation. Nina doesn’t want the things that he wants. They tried to fit that square peg into the round hole and it’s not going to work. He really would have had to sacrifice so much not only by leaving Toronto, but then what does his life look like in Paris? It was definitely a sad thing because we’ve all grown to love that character and Erin, but there wasn’t really a way to turn that ship around and have her be the person that Crabtree is ultimately the person he’s meant to be with. Peter Mitchell: George could try to abandon his core principles but I don’t think he has it in him. I think he does want whatever the turn of the century version of the white picket fence is. I didn’t want to compromise the Nina character and have her roll over on her core beliefs to make George happy. Sort of like Ogden and Murdoch, but in a different way. By the end of the episode, Violet is plotting with Horace McWorthy to take over the morgue? How did you feel about that twist Hélène? Hélène Joy: I thought it was great. I know the audience loves to hate some characters and this character is on that hit list for sure. That’s what’s fun about Murdoch. We try to keep it surprising. You can’t love everyone all of the time. I think it’s great that it’s happening this way and makes it far more interesting for the character and for the actress playing the character. I’m really intrigued to see where it goes. How evil is she going to get? I feel for Shanice because I know what it’s like to be hated. If you remember back to Julia’s first husband, Darcy, there were whole Facebook pages that were just about hating Darcy. What excites you about Season 12? Hélène Joy: I get excited because the writers always blow me away. I hear little rumblings about what Julia these things that Julia will be doing this year and I’m like, ‘Oh! Who would have thought? !’ Of course, I can’t tell you! Peter, will there be a time jump between Season 11’s finale and Season 12’s debut? Peter Mitchell: Yup. Normally, we pick it up three or four months later and I think that’s so we can start off on a fresh foot while doing some housekeeping as to what happened last year. Any storylines you’re working on that you can talk about? Peter Mitchell: We have an idea that Julia and Murdoch might be writing a book together, which could be fun. We might actually find George’s girl of his dreams this year. There might be some interesting developments in the Brackenreid household and the wedding bells will indeed ring for Henry Higgins. I think we might have Alexander Graham Bell back—he’s a fun character—and introduce the architect Frank Lloyd Wright … a couple historical figures we haven’t seen yet and a couple we’ve seen in the past. We’re just getting started. 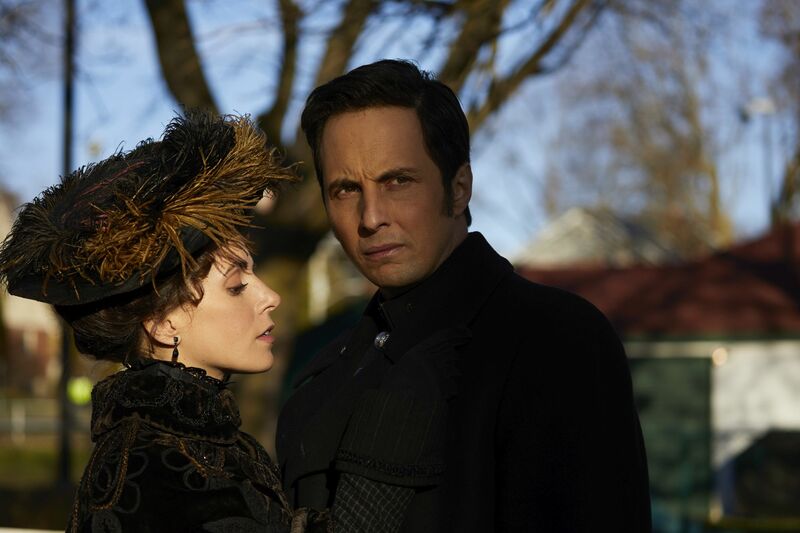 What did you think of Murdoch Mysteries‘ Season 11 finale? What do you hope for Season 12? Let me know in the comments below! 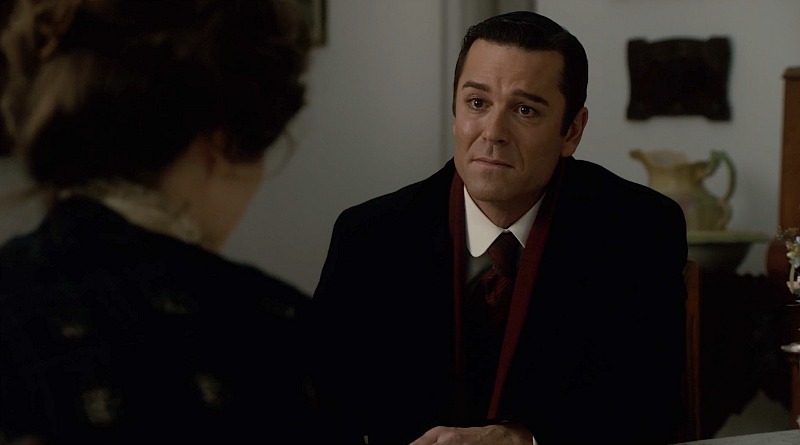 Murdoch Mysteries writer Mary Pedersen’s goal was to make fans cry with Monday’s newest episode, “The Accident.” I say mission accomplished. Dilton Dilbert (David Hewlett), city clerk, became the latest victim of a murder plot when he was pinned between a car and carriage while on his morning walk to the office. Unable to move him because he’d die, Dilbert professed his love to Mildred Ash (Angela Vint) moments before he expired. “The Accident” was unique on a couple of fronts. First, in confined all of the major and supporting characters within the Murdoch Mysteries backlot. Secondly, it was set in real time, adding to the strain of the situation. We spoke to Pedersen about the episode and the inspiration behind it. This was a killer episode! Mary Pedersen: Thank you so much. It was really, really fun to do and I’m really proud of it. It’s kind of a twist on the bottle episode. Not everyone is stuck in the same room, but everyone is in the same place and that made the episode really unique. Yes, and also having a very short timeline was part of the original idea and that brought a lot of energy and a fresh challenge to writing that episode that was really fun. It’s not our normal plot. How did the story originally break in the writer’s room? When we were prepping for our development room in the winter, I watched, with Murdoch in mind, a few Alfred Hitchcock movies. I watched Rope and came to the room saying, ‘Let’s do a dinner party and the killers are trying to catch Murdoch out … essentially let’s do Rope.’ Pete came up with the accident part of it, really with the thought in mind that if it was out there on the street then there is some pressure on the situation. People need to get where they’re going. And one of my favourite early episodes of TV was the ‘Subway’ episode with Vincent D’Onofrio in Homicide: Life on the Street. [Editor’s note: That Homicide episode is entitled “Subway,” but is often referred to as “The Accident.”] Those things came together and started writing itself. And then, when we were trying to figure out which character to have standing there crushed between two vehicles for five days [of filming], somebody came up with David [Hewlett] and it was genius. He was fantastic; it was such a dream to watch him make that story happen. I was wondering how you decided on Dilton Dilbert to be the one trapped there. You needed a character that fans already knew and cared about rather than someone no one had met. Right. And that was sort of my idea going into it, that it would be all new people, but someone in the room came up with David’s name and once they did there was no other conversation. And then we were lucky to get Angela [Vint] as well. I’ve been a fan of hers since Traders way back when so watching the two of them do scenes together was a dream. Let’s talk about the challenges surrounding this episode. There was such a large cast of characters to juggle alongside our regulars. Was that tough to write? By the time it gets to [production] that’s the challenge of the director. I had envisioned going around and around and around the accident and making it work inside of our backlot. [Director] Alison [Reid] and the assistant directors and the art department had to make that work. The art department had to come up with streetcar tracks in our backlot. At one point it seemed like an impossible task and Bob [Sher] was like, ‘Well, let’s give it a go,’ and that was fantastic. I did get dirty side-eye from the ADs for sure. And, when we wrote it we thought it might be a bit shorter of an episode for filming because it was all in one location but I don’t think we wound up saving any time on it. And it also wound up being one of the hottest weeks of the summer so the crew and cast were out on the backlot just broiling the entire time. But they’re total pros and troopers. The other cool thing about this episode was when Alison pulled back it allowed viewers to see not only the full backlot but the CGI work to show the growth of Toronto. I love that, and being able to walk down the street to where the streetcars are parked. It was a real team effort. Those were quite the emotional scenes between Dilbert and Brackenreid. If you’re going to care about the murder and spend an hour with the guy, we had to feel something. What is that like? You know now that your time is limited. One of the reasons that I gravitate towards Murdoch and shows like it is they’re not typically focused on the tragedies and the sadness and the loss. For the most part, you’re able to focus on the puzzle and the mystery and what the detective is doing to solve the crime. It’s really a part of the show that we don’t normally see and that’s on purpose because we want to focus on Murdoch’s own detective work. This story required some emotional bang. You certainly get the emotional bang when Dilbert is speaking with Mildred Ash. They flirt a bit when he says he’s admired her shorthand. Him viewing himself as just a cog in the machine. It’s heartbreaking, Mary! How could you do this? [Laughs.] If you were dying too soon, at least I would reflect on the great thing that I thought that I would accomplish. And it is kind of heartbreaking. Mary, people will have cried watching this episode. Are you happy with this knowledge? That was a very patient pig that you had John Brackenreid holding. We had the pigs and the chickens and the fire hydrant. The fire hydrant was on the bubble several times and Pete just kept rescuing it from getting cut. It was great that we were able to keep all of the farm animals and people were so delighted with that pig. It was a pretty rough week shooting but the pig really brought people’s spirits up. Despite all of the difficulties, this episode really helped to expand the world of Murdoch Mysteries in my mind. Even the off-hand comment about the Gooderham & Worts building being a flatiron building helped me place where in Toronto we’re set. That’s awesome and I’m so glad. It was so interesting looking up things like traffic accidents at the time. The boy whose cart rolls over in the street it was originally written as a 13-year-old with a little motor van because, of course when you think of it, there were no regulations at the time. You could drive at any age, it was all so new. And, I think, there had only been one car fatality at the time and it was kids playing in the street and man ran over a kid and was like, ‘OK, I need to be on my way.’ There wasn’t the same protocol for an accident that we have today. Or even Murdoch going, ‘Wait a second, I think there is some fishy business going on here,’ would have been very unlikely for the time. What did you think of “The Accident”? Did you enjoy it as much as I did? And confess: did you cry? Let me know in the comments below.